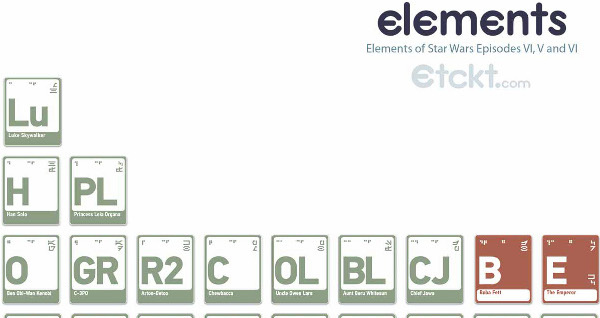 Periodic tables are a good way of conveying information. Like, you know, the elements. But they also can be a fun way of showing other elements. This one by etckt shows different characters from the original trilogy, all organized by affiliation to the Rebellion and Empire. With the release of our May the 4th Be With You illustration and in preparation for this year’s Star Wars Weekends at Disney’s Hollywood Studios, we wanted to create something special to commemorate our love for Star Wars. In the same series as our Elements of Attractions at the Magic Kingdom, we have created a new periodic chart based on Star Wars characters from the original trilogy episodes: IV, V, and VI. The first thing we had to think about when designing this new table of elements was the data that was to be contained on the tile. Naturally, there is the Element ID and name but what else could we include. Working through some thumbnails, we settled on the cast order, episode number and the actor’s initials. When working through the first drafts, it was starting to look good, but wasn’t entirely what the original concept we had hoped for delivering. After much research, we were able to find one of the alphabets used in the films, Arabesh, and decided to use that for some of the ancillary data on the tile. Once that was in place, the tone of the elements seemed to be exactly what we were hoping to create. The next hurdle, however, was what kind of color scheme could we develop. Since this is Star Wars, we quickly settled on using the colors from Luke’s and Vader’s lightsabers. So starting with green and red, we worked through a number of color options, to develop a more vintage vibe for the piece. Ultimately we ended up with six total colors being used across the Rebellion and Empire elements that further divides up the elements based to the episode. Now there are lots more characters, both credited and uncredited in these three film but we settled on all of the major characters as well as an acceptable number of secondary characters through all three films. 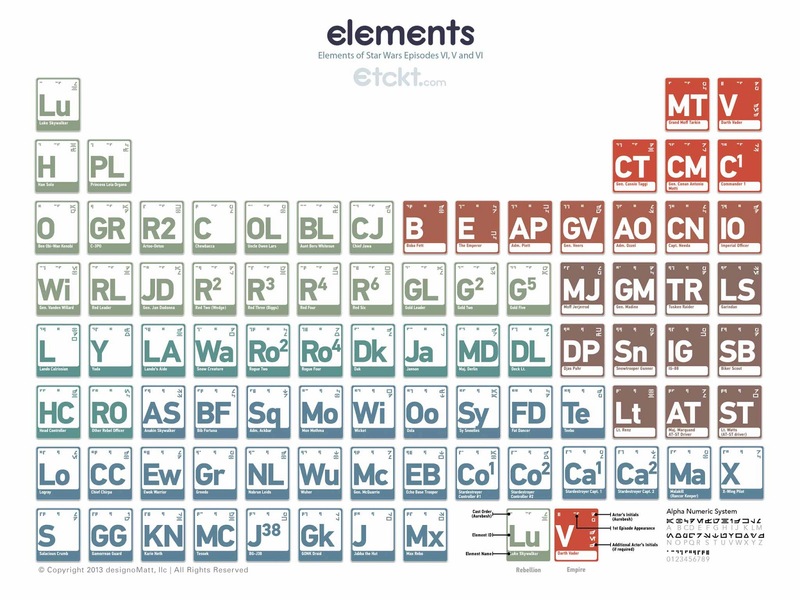 What do you think of the periodic table? I think its a TRAP! This takes Star Wars Geek to new levels. I LOVE IT!! !